We can't inform you enough! Wire fraud is real. We can’t inform you enough! Wire fraud is real. Wire fraud phising attacks are getting more sophisticated… 3 attempts thwarted in the Milwaukee area alone recently. Buyers and sellers need to be aware or they could lose tens of thousands of dollars (or more). Buying a home is an exciting, complex, sometimes confusing process with all sorts of steps to get to the finish line: the closing table. Buyers trust their agent, looking to them for guidance and doing what is needed to get to that closing table and into that new house. But, there’s a new criminal scheme emerging attempting to derail the closing and steal the buyer’s money. Not your typical email scheme. You’ve no doubt received emails promising that millions of dollars would be deposited into your account in thanks for helping some poor person overseas. Pretty obvious scam. Criminals are getting smarter. The email of the home buyer or the real estate agent is hacked by scammers phishing for financial information. Once in the email account, the scammers are able to read emails, learning about the planned purchase, the closing date, the dollar amount needed to bring to closing. Scammers then send an email to said buyer posing as the real estate agent or the title company involved in the transaction. They indicate there’s been a last minute change or an “update” to wiring instructions for the money needed to complete the home purchase. Basically, send the money “here” instead. “Here” is to an account the spammers own. There goes perhaps hundreds of thousands of dollars meant to be the downpayment/closing costs on a dream home. Gone just like that. The Federal Trade Commission and National Association of Realtors are involved and aware nationwide. They caution: Do not email financial information. We additionally state your First Weber real estate agent will NEVER email you wiring instructions. Email Security Advisory: Do not send funds or nonpublic personal information, such as credit card or debit card numbers or bank account and/or routing numbers, by email. First Weber, Inc. will never request that you send funds or such nonpublic personal information by email. 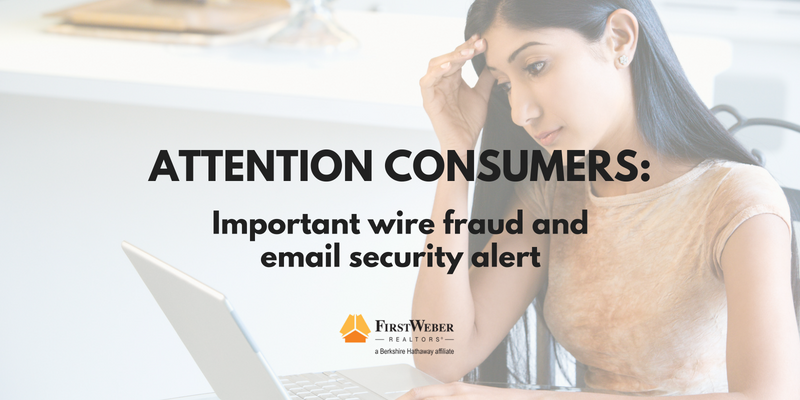 If you receive an email message directly or forwarded concerning any transaction involving First Weber, Inc., and the email requests that you send funds or provide nonpublic personal information, do not respond to the email and immediately contact First Weber, Inc. at 608-443.2255, and please forward any suspected email fraud to antifraud@firstweber.com. When in doubt, call your agent. The internet has changed the real estate transaction, and countless other things, for the better in many ways. Unfortunately, hackers and scammers have upped their game and found ways to interfere with important life events like buying a home. Be careful, be informed, call your agent.